England v New Zealand: Is Julian Savea better than Jonah Lomu? "He either ran round people, because he was incredibly quick, or he could literally barge them out of the way. Or they would step out of the way, because they didn't want to get hurt. He had a fend; his right knee was generally his fend." A summary which could serve as a perfect description of Jonah Lomu, arguably the most destructive - and probably the most iconic - winger in rugby union history. Except it is actually a description of the man who may yet be his superior. When he was 13 years old. How good is Julian Savea? Better than Lomu, according to current New Zealand coach Steve Hansen, better than Lomu according to the stats. 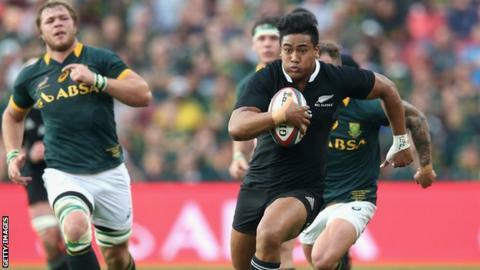 Going into Saturday's clash with England at Twickenham, 24-year-old Savea has scored 29 tries in 30 Test matches. That is 12 more than Lomu managed in the same number of games, nine more than the similarly feted George North has scored in half as many caps again. And he reserves his best for England. In four matches against the men in white, the 6ft 3in, 16st 4lbs All Black has scored eight tries. On each of his two previous visits to Twickenham, once in narrow victory, once in thumping defeat, he has been unstoppable down the left wing and pretty much everywhere else he has popped up. At times in his two and a half year international career, it has appeared to be men against boys. Which it always was. "I first saw him was he was 13, when he already weighed 14 and a half stone," says Ross Findlay, former director of sport at Rongotai College in Wellington and source of that opening tribute. "The main tactic was just 'Give the ball to Jules'. There were some very good players in that year, but he was a one-man wrecking-ball. "Other people caught the ball and basically manoeuvred it into a place where he could wreak the most damage. When he got the ball he was almost assured of scoring a try." Aged 14, Savea was promoted to the school's first XV, coming up against boys four years his senior. They didn't enjoy it. You can still see the footage on YouTube: Savea storming forwards, sideways, ever onwards; other kids flying backwards, spat out of his path like desiccated stalks from a threshing machine. No matter that on Sundays he and his younger brother Ardie would be forced into impromptu dancing competitions judged by their aunties, or that he was quiet and shy away from rugby. On the pitch he was, well, Lomu-esque. "You'd have to say that at times it was Julian Savea 25-6 St Pat's College," says Findlay, who also coached future All Black battering-ram Ma'a Nonu at Rongotai. "He could take any team apart, and he could score tries, at times, at will. "I have seen him be given the ball inside his own 22, push off, fend, accelerate and score underneath the sticks. And if he did that once he did it hundreds of times. "He was absolutely devastating, capable of striking the fear of God into other players. Inside the 22 he was virtually unstoppable. If someone didn't manage to ankle-tap him at the start, you were assured of a try. "It was expected of him. When he went onto the field, the other players were waiting for him to save the game. That's what he could do. Even when we were under pressure he could just break that line so easily. It was amazing to watch." His father Masina Savea and mother Lina, both born in Samoa before emigrating to the southern tip of New Zealand's North Island, had been talented ball-players, one a fly-half, the other a netballer. Their eldest son appeared to be a sporting polymath. In his first summer at school he produced a shot put of 12.92 metres, still comfortably the college record. Aged 14 he long-jumped 5.86m and threw the discus 43.92m. Lomu's influence hung over him from the start. His earliest rugby memory, aged five, is of Lomu trampling current England attack coach Mike Catt and the rest of his traumatised backline as he ran in four tries in the 1995 World Cup semi-final. He even had his hair shaved in the same distinctive quasi-Tintin quiff. Last June, in the third Test against the same opponents, he went close to matching the try-count too, scoring three times as England's current defence was dynamited once again. Savea himself insists he is still pupil to master. "For me personally, no-one's better than Jonah. He was my idol growing up. He changed the game back in his era and inspired a lot of kids, so to me no-one is ever going to be better than Jonah. He was one in a million." Other wise wingers aren't quite so sure. Lomu could be turned in defence, could be suspect under the high ball. Savea can pass, tackle, off-load, catch and step. "There is no obvious weakness to Savea's game," says Mark Cueto, scorer of 20 tries in his 55 appearances for England. "I've never known him kick the ball, but when you're a winger in a dominant team like the All Blacks it's very rare that you have to. They manage to get players back in support so that the back three can counter-attack with ball in hand rather than having to kick. "It's still almost men against boys. Even bearing in mind that he's playing in a dominant side, the tries that he scores aren't just run-ins. He's got weight, build and power, plus outstanding footwork. "Someone like Lomu was a big guy. But because all the other players around him were smaller than they are now, it made him appear bigger than he was. "The all-round ability required now is probably better than it was then. If you could bring Lomu from his prime into the All Blacks team now, he probably wouldn't be able to adapt his game. Wingers can no longer wait on the wing for the ball to come to them." If Cueto could pick only one of the two for his all-time XV, which would it be? "I recently watched again the England v All Blacks game from 2002. Lomu's not in the game. The amount of time he's turned the ball over or he's knocked it on is remarkable. "There was this fantasy aura about him, and you forget the mistakes. I'm amazed at how many he made in that game. "But then he beats five defenders, or scores a try when he runs over the top of Mike Tindall and then carries three others across the line on his back. "You can only judge great players in the context of their own eras. And if you do that, you have to go with Lomu every day of the week. That try in the World Cup semi-final of 1995 - no-one had done that before. And it would never happen now. "If you compare him to other wingers then, you'd have to put Lomu ahead of Savea, even though there are very few wingers today as dangerous and threatening as Savea." "One of the keys is not to kick loosely to him, particularly the way the All Blacks get back and support in a counter-attack situation. The last thing you want to do is give him a 20-metre run-up. In phase play you have to stay connected to the guys around you. You need the guys inside you to work really hard so that as a winger you're not exposed - give a guy like Savea a one-on-one with five metres and nine times out of 10 he'll beat the defender or get an off-load out of a soft tackle." In Pacific Islands culture there is a cherished personal or collective quality called mana - an idea that only roughly translates into English, but can be taken as a spiritual amalgam of authority, power and presence. You can be born with mana or earn it in warfare. Arrogance or misjudgements can diminish it. Savea has not always maintained his youthful humility. In April last year he was charged with assaulting his girlfriend, and was forced to make a public apology and attend counselling. But as a young man he showed enough to be made school sports captain in his final year ("appointed by the principal for his sheer mana," says Findlay). As a supercharged young superstar he is doing the same on a sporting battlefield, just as the famously self-effacing Lomu did two decades ago.